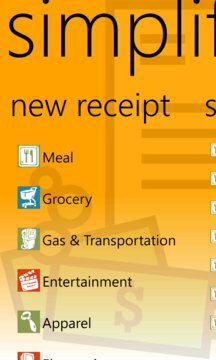 Simplify Receipts is the ultimate solution to organize and digitize receipts right on your windows phone! Simplify Receipts features an initiative user interface to allow quick access to create receipt record, view past receipts and expense reporting functions. Creating a record of the receipt is just a 3 steps process. 1 – Select an expense category, 2 – Take a photo of the recipe (optional) and 3- Fill in the detail to help you to remember it. You can also attach multiple images of the actual receipt for safe keeping. You can also email yourself a copy of the receipt detail! 1. Export receipt summaries and generating reports to your PC/MAC. 2. 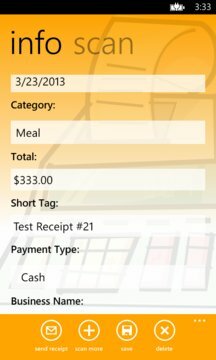 Ability to add, update and delete receipt categories. If you like this app don’t forget to rate it.